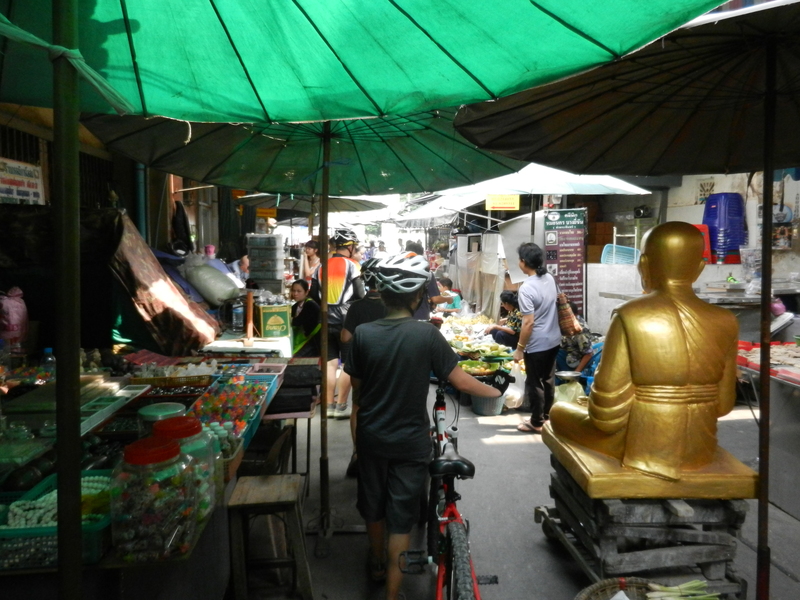 We rode through the back streets of Bangkok this morning and saw nothing famous and it was absolutely wonderful. 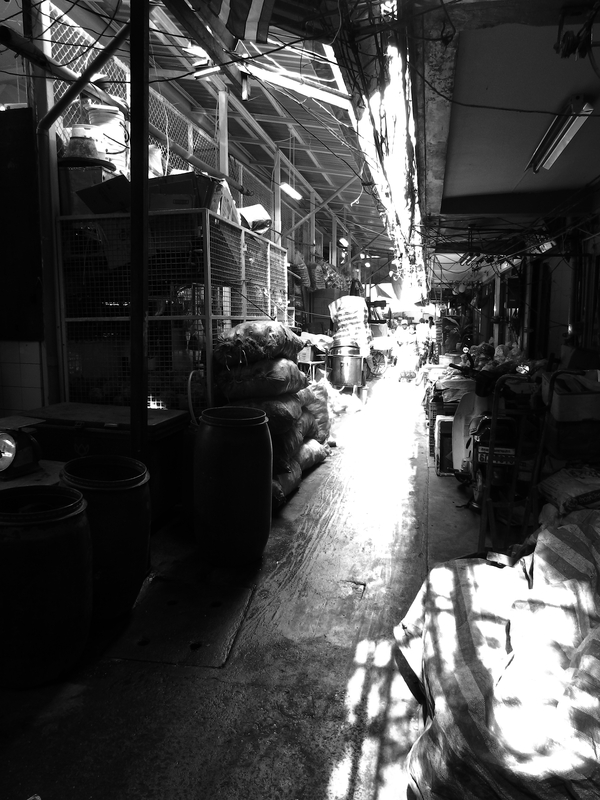 Sixteen kilometres of tiny lanes and canal-sides gave us an entirely different view of Bangkok. Some of the lanes we so small we couldn’t identify where the lane edge lay and the tiny shacks that border them started. Less than a metre wide the lanes were bordered by people’s’ kitchens and living rooms and we were basically riding through their houses. People were surprisingly friendly about the whole thing; they were mostly older and seemed quite pleased to see us, or at least some kids, riding through. (The younger men we saw seemed at least as taken with the young Swiss women who accompanied us.) Often we were brushing through people’s laundry hanging out to dry in the Sun. 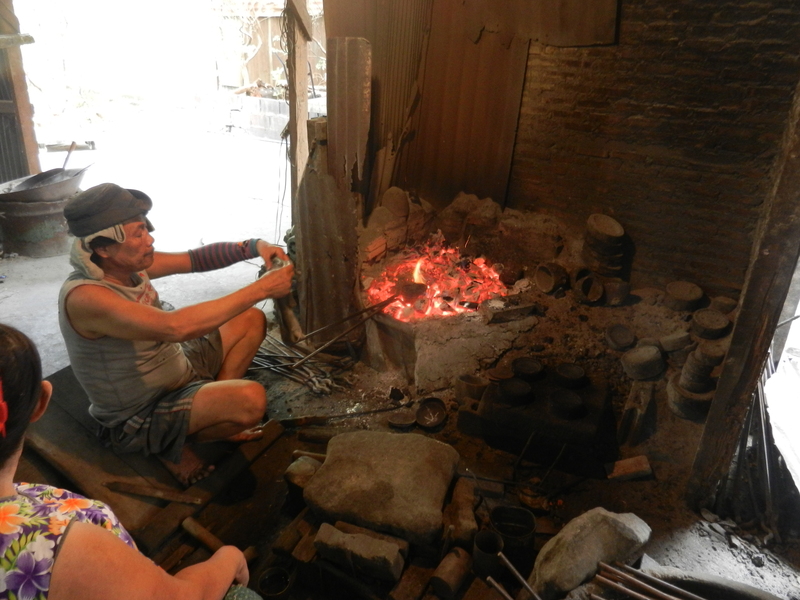 At one point we visited a bronze foundry behind a house. The whole area we were in was once known for bronze-work. It was all done by hand with a couple of people hunched over white-hot forges. The heat was oppressive but the results were absolutely beautiful and part of an unbroken tradition running back many hundreds of years. We caught a local ferry over the canal and dodged more serious traffic. Callum had an altercation with the front end of a tuk-tuk. We visited an three-hundred year-old temple, that is now barely functioning and saw tortoises at another old temple. We dodged monks in the street, and marvelled at a large reptile that had recently eaten, well, something. We didn’t see anything famous to speak of, but we got an insight into how the real people live in Bangkok and had a fabulous day. I woke up this morning and watched the river that runs through the heart of Bangkok come to life. Enormous trains of barges are pulled by tugs up the river and jostle for space with long slim ferries. The river runs like a backbone through Bangkok, but the city’s beating heart and arteries are the roads. There are huge roads jammed with cars everywhere. The city lives with a background roar of traffic and an ever-present smog of exhaust (so dense that last evening we saw sunspots on the Sun through the filter provided by the smog). Apparently locals discuss the day’s traffic in much the same way people in other countries discuss the weather. Our plan for the morning involved going to see the floating markets and the train market with a local guide. We were met by our driver at 8am and he explained that our guide was stuck so we’d pick her up on the way. She was about a kilometre away. We set out into the traffic and almost immediately ground to a halt. It took us an hour to cover the distance to our guide and our driver explained that was pretty typical for Bangkok. It seems that over the last few years everyone in Bangkok has traded a motorbike for a car, so the roads are filled with vehicles. But cars don’t flow like bikes, when in clumps they judder along. After picking up our guide we juddered further out of town. Our poor planning was then revealed in all its glory when we realised that it was an hour-and-a-half to drive to the markets. So that would have seen us spend a minimum of four hours driving today. On top of that our guide briefed us on how touristy that whole thing was as part of explaining what to watch out for (stall holders tripping you into the stall so you have to buy what you spilled, for example). 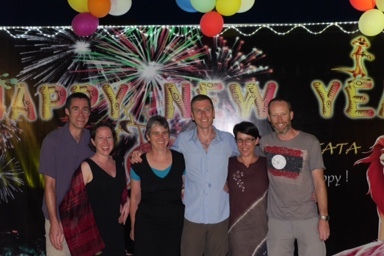 We took a vote and decided to ditch the whole market experience and head back into Bangkok. The drive into Bangkok took us past a huge march by the opposition protesting against the government. They are threatening to bring the entire city to a standstill next week, and were doing a fine job of practising deadlock in the part we were in today. Our new destination was the Royal Palace and as it turned out we were very pleased to have more time there than we expected. The Palace is one of the most beautiful complexes we’ve seen. The core of the Palace is a huge temple, the entirety of which is decorated with paintings and statues and mosaics. The colour is stunning and heightened by the fact that there are reflections everywhere from glass and ceramics and gold-leaf. The architecture reflects Thai history and empire and so there are Chinese influences, domes mirroring Angkor Wat, motifs from Lao, wrought iron lights from London, thanks to the Anglophile Rama V. The overall effect could be gaudy, but seems to work wonderfully. 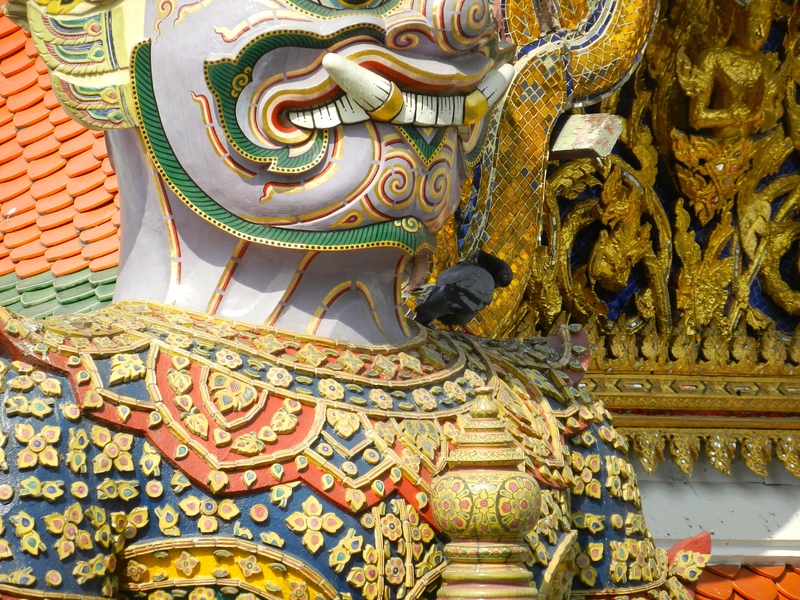 Inside the Temple sits the Emerald Buddha. It’s not actually emerald and may not be quite the 2,000 years old claimed but it is certainly extremely old and sits atop tiers of gold and jewels and decoration. The overall effect is lovely, although the Buddha itself is too small to really be seen from a distance. The surrounding Palace is now only rarely used in State occasions. It’s lovely too, but heavily influenced by Victorian London. Rama V was brought up with an English tutor, the Ana story is apparently based on some reality, and went to school in England. He became friends with Queen Victoria and returned to take his throne and modernise the country to the English model. 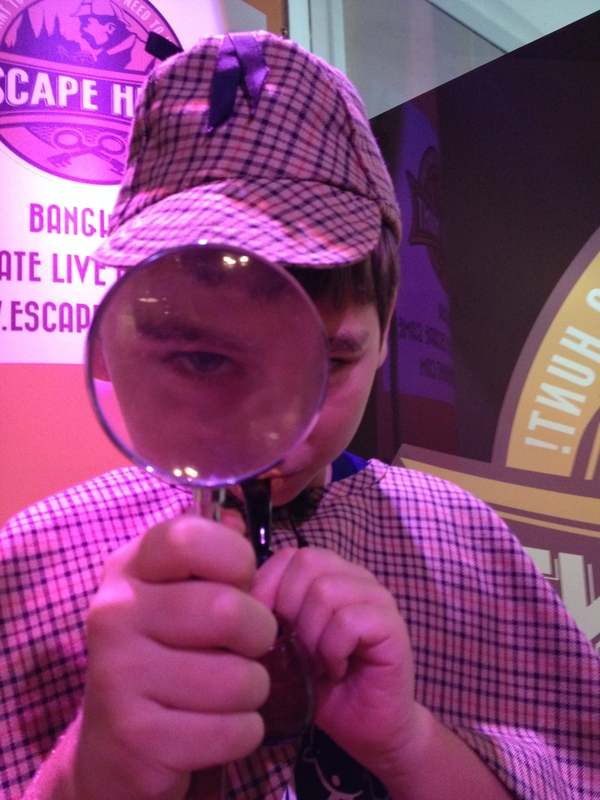 Architecturally he pulled it off, and they do drive on the left; the guards outside the palace were not up to Buckingham Palace standards, though, as evidenced by their twitches, slightly unpolished shoes, and the fact their guns had no bullets. 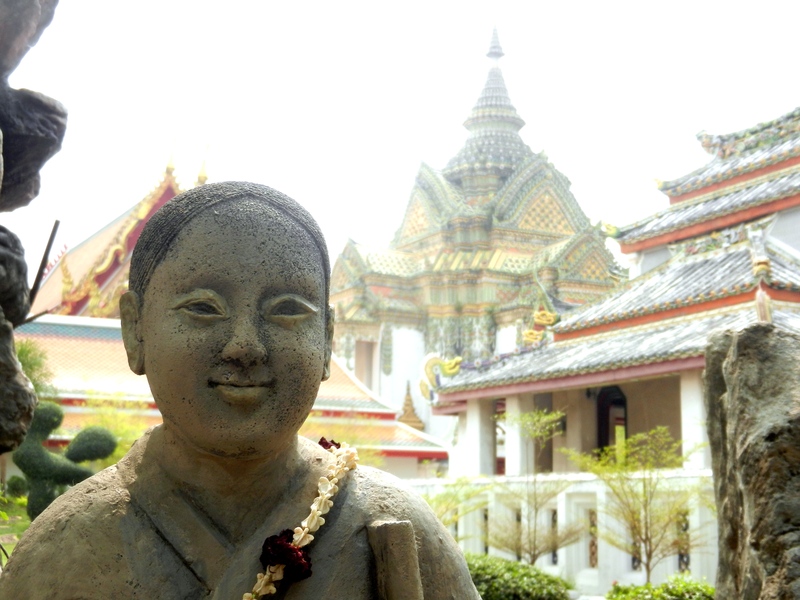 Monastery in the Reclining Buddha Temple. Then once again into the traffic for a fascinating visit to a Buddha that lies in distinct contrast to the Emerald Buddha. 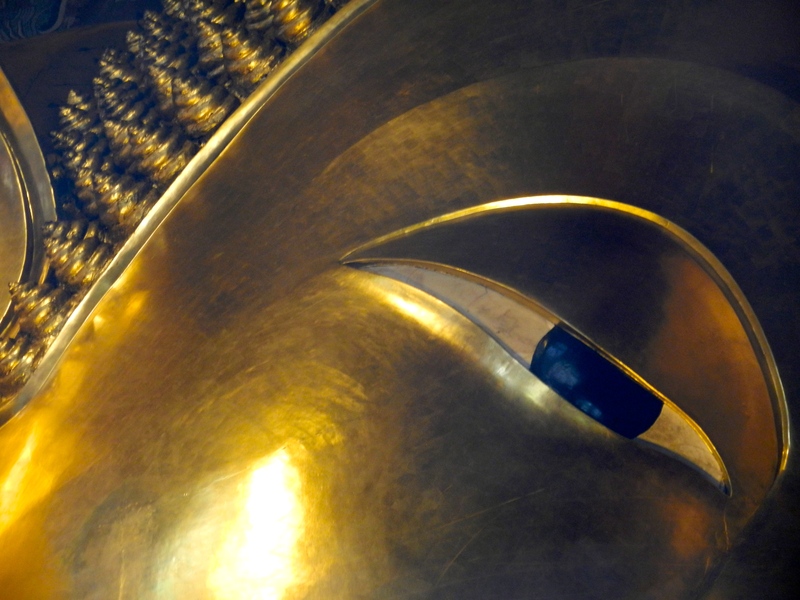 The Temple of the Reclining Buddha houses an enormous Buddha that’s lying peacefully on its side. It’s the second largest in Thailand and certainly impressive. The boys dropped the traditional 108 coins into the alms kettles behind the Buddha. We then visited the monastery and saw individual Buddha statues being gilded. The monastery was one of the original places where medical massage was developed and taught and there are ancient tablets depicting pressure points and their usage. All of which stands in stark contrast to Bangkok’s modern-day massage reputation. Our final stop for the day was the flower markets. Flowers are a big thing in Thailand as they form an important part of temple offerings and marriage ceremonies. The flower markets are very much not a tourist experience – and so were great. The markets are a bustle of people and colour and smells. We spent our entire time jumping out of the way of men pushing baskets and carts of flowers and vegetables through the narrow lanes. Which was immensely more fun than dodging cars. Demon in the Roytal Palace. Boat at Floating village on Tonle Sap. When is kayaking like riding a bicycle? When you are paddling through the lanes of a floating village of course. 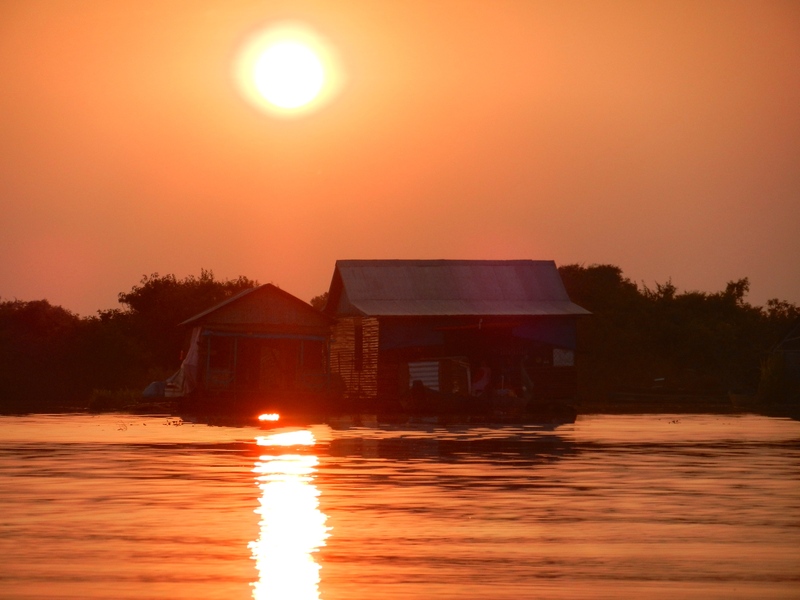 Tonle Sap is South East Asia’s largest lake. It flows in two directions depending on the season. During the dry season is covers about 2,000 square kilometres and is less than a meter deep. Then the rains come; the lake quickly covers 16,000 square kilometres and has an average depth of 9m. That enormous change drives the lives of the people who live on the lake. And I do mean ‘on’ the lake. The floating villages of Tonle Sap are built on rafts of bamboo. People spend their entire lives within these floating communities, moving with the rise and fall of the waters. The small village we visited has some mobile phones and televisions, and outboard motors of course, but otherwise is probably much the same as it was 100 years ago. 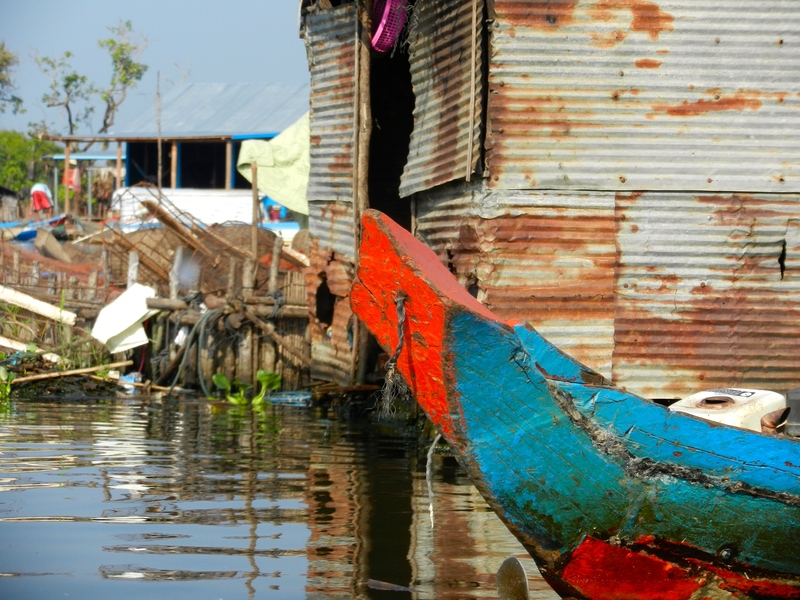 The community relies on fishing for its livelihood, although many of the floating houses also have floating gardens or floating pig-pens to supplement their diet and income. We kayaked around the village – which for a place like this is akin to riding a bike around the roads. The main reason the whole village moves with the rising waters is a combination of being near the fishing and keeping safe from the weather on this huge lake. So the secluded spot they currently reside on has not the slightest natural ripple on the water. The village is extraordinarily peaceful. Even as we visited, though, they were moving houses further out into the lake as the waters receded. The school had been moved last week and now sat in lonely isolation about a kilometre further out than the village. As part of the huge rise and fall of the lake, the surrounding forests spend half the year under water. We kayaked through one of these drowned forests; sliding down narrow paths through the tangled trees to see where the fishermen lay their nets to catch literally tons of fish as the lake drains. The drowned forest was somewhat eerie but again beautifully peaceful. Finally we paddled between long banks of flowers to pop out into the open water and be picked up by our mother boat. As the Sun went down, casting golden lines on the water, we sped back to land. We drove past locals lounging about in the quiet of the day, their work done, and simply watching the birds fly home, the fish jump, the insects skitter, and some foreigners slide on by. For those who might come after: Floating Village tours on Tonle Sap have a terrible reputation as a tourist rip-off. We used Unique Kayaks and, although they are expensive by local standards, completely avoided both the crowds and the rip-offs. Floating village on Tonle Sap. Moving house in a Floating village on Tonle Sap. Drowned forest on Tonle Sap. Sun going down in the drowned forest. Look up, Gentle Reader. 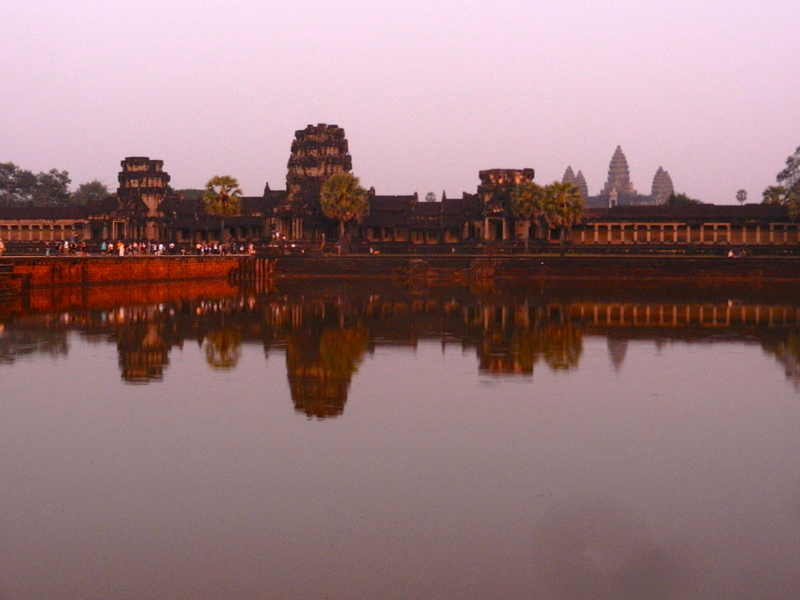 See the looming towers of Angkor Wat silhouetted against the stars behind. See the gentle shimmer on the water that promises a reflection amongst the lilies once the Sun rises. Contemplate the peace and beauty of the moment in front of the mysterious Eastern monument. Then, Gentle Reader, look down and sideways. See the thousands of people gathered and jostling for the best spot to capture a photo. See the land lighted by the glow from hundreds of camera screens. Close your eyes to the flashes. Watch the people gathered on the lake shore like a school of fish, while the sharks that are the touts cruise through selling guidebooks and coffees or perhaps, in the case of the more serious predators, just sliding too close to backpacks and pockets in the dark. Realise that those ripples on the water turn out to be the fevered motion of thousands of insects which, as the sky lightens, make the surface of the lake look like it is raining. After returning to the hotel for breakfast and showers, we headed off again. We had a new guide today, who gave a different insight into modern Cambodia and the depth of corruption that infects every facet of life in this terribly poor country. Between a poor starting point and decades of terrible wars Cambodia is a mess; and the selling-off of any asset that looks to have value to the Vietnamese is robbing the people of what little hope they had to improve their lot. The poverty of the country today is thrust into stark relief when you realise that Angkor Wat and the surrounding temple ruins are evidence of an enormously sophisticated and powerful empire that flourished here a thousand years ago. There is evidence that they, then, had multiple rice crops annually; now they can barely manage one. That one crop is generally just enough for a family to live on and they then spend their ‘free’ time selling to tourists to make money for clothes and necessities beyond a subsistence level of food. 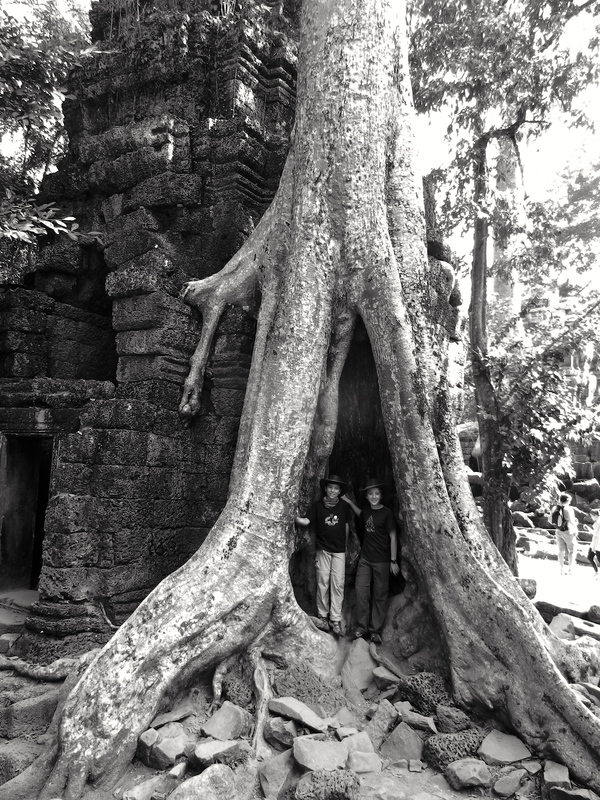 Anyway, we were off to Ta Prohm. This temple is the one that captures everyone’s imagination as it is still partly overtaken by jungle. Clambering around the ruins has a sense of exploration about it; a feeling that this must be what the early archaeologists were searching for and finding. And in honesty it is lovely to behold. But again, the hordes of tourists meant that there were literally queues for photos at the many photogenic spots. I’m trying to put my finger on how to express my disquiet at being part of a process that by the very act of doing it spoils the thing you are doing. All thousands of us who visited today will come back with photos that will look like we were exploring a peaceful, jungle-covered ruin – which is simply not the case. The Hindu religion, to which all these temples we’re seeing were dedicated at one time or another, has the major gods balancing creation and destruction – you can’t have one without the other. There’s some analogy to tourism there – the very fact that a thing is worth seeing attracts people to see it and in that act lessens some of what made it attractive in the first place. 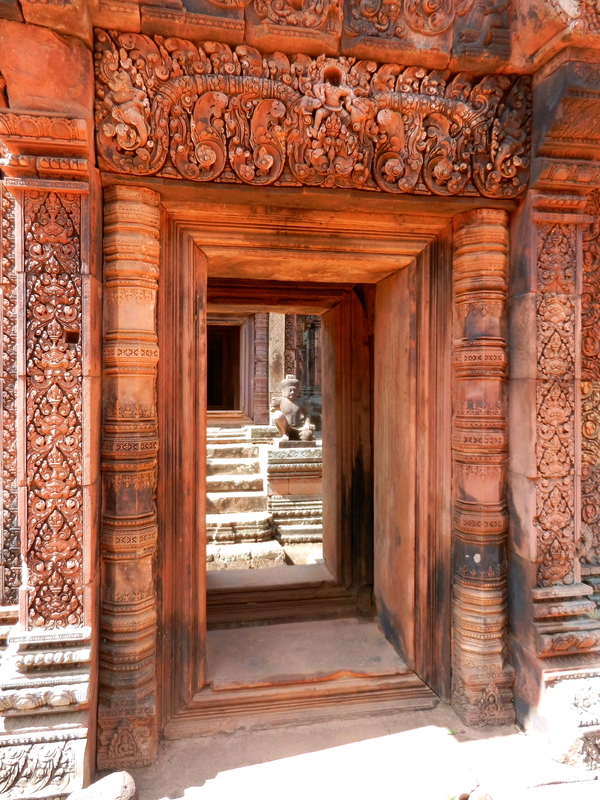 Our final temple was Banteay Srei, which is a small gem. It isn’t as extensive as many of the other temples, but it is beautifully executed and, having been built of superior stone, remarkably well-preserved. Banteay Srei is about 35km out of Siem Reap and so we had some opportunity to see the local countryside. As we drove out the contrast with rural Vietnam was stark and clear. Vietnam was poor but always seemed well-maintained and hard-working – the rice fields for example were perfectly maintained. Cambodia seems to be a whole level further into real poverty with scrabbly rice fields and people fishing in pools barely big enough to stand in. As we arrived at Banteay Srei we even had the attendant policemen try to sell us their badges as souvenirs. And maybe that balance is really what the whole tourist experience is about. Even though our being there detracts from the very peace and unspoilt beauty we’ve come to experience, we still gain something by being there and by being able to imagine the place as we want it to be. And that, Gentle Reader, is why I’m still happy to have spent a couple of hours standing in a crowd waiting for the Sun to rise over Angkor Wat this morning. As we drove to Angor Wat this morning our guide, Lee, gave us a bit of an insight into the pragmatic nature of modern Cambodian Buddhism. Buddhists wont kill anything, he told us, but Cambodian Buddhists will eat meat as long as they don’t kill it themselves. They’ll even go to the live fish shop and ponder out loud how fortunate it would be if a particular fish were dead and so available for cooking, look away, and then turn back pleasantly surprised that the fish was the very next one that the fishmonger had decided to kill. Some of that same pragmatism can be seen in the architecture of Angkor Wat and the surrounding temples. They all have incredibly steep flights of narrow stairs leading up to the top. The purpose of these stairs is to force worshipers to crawl upwards, abasing themselves before Buddha. In each, the King’s stairs are significantly less steep. Angkor Wat itself is impressive in its scale, but is largely better observed from the outside than from inside. The major element that makes any internal visit worthwhile is the enormous frieze on the lower level depicting a battle between the gods and demons. The scope, complexity and workmanship in this huge bas-relief is stunning. The Temple was originally Hindu and when it converted to Buddhism in the 1600s the monks, displaying that pragmatism again, marked the change by painting red Buddhist robes on all the statues and carved figures: There are still significant swathes of red paint visible. Of course that beats the Khmer Rouge hands down as their contribution to the decoration is deep pockmarks from bullet strikes. Angkor Thom was built about 100 years after Angkor Wat and in slightly different style. It used inferior stone and so isn’t as complete but I think it actually looks better. 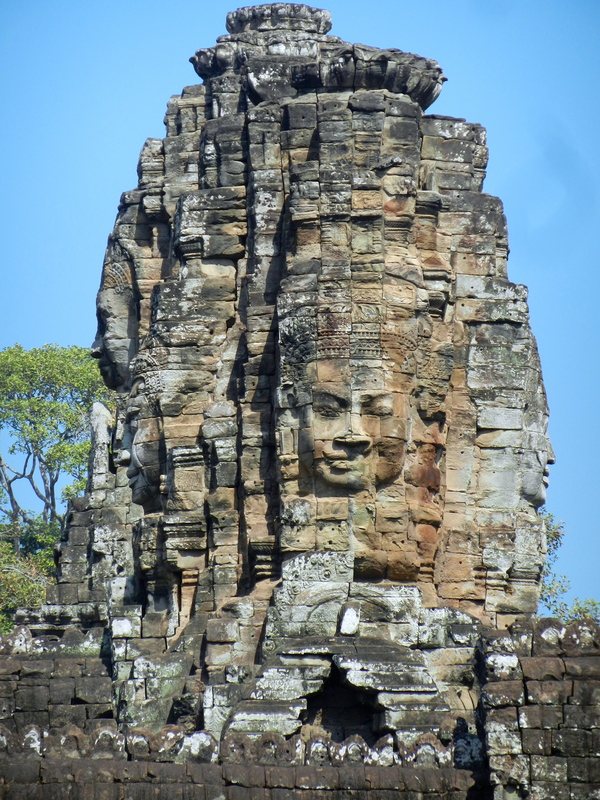 The intriguing thing about Angkor Thom is that there are faces of Buddha peering from amongst the ruins all over the place. Angor Thom looks like the quintessential ruined jungle temple. Around the lower reaches of the temple are a series of bas-reliefs that depict everyday life at the time the temple was built. They make for a fascinating insight into normal life in what was the heart of a sophisticated empire at the time that Western Europe was only just managing to extract itself from the Dark Ages. Frieze depicting hell beneath the Leper King. We visited a couple more temples in various states of disrepair. The frustrating element for Declan was that children under 12 cannot climb the steep stairs of the temples and so he was very relieved when we came to one that didn’t have a security guard. The mild irony is that we are constantly having to flash a copy of Declan’s passport (because children under 12 also don’t need a ticket) to prove that he’s under 12 because he’s so large compared to Cambodian kids. These later temples were also more crudely converted from Hinduism to Buddhism – with many of the carvings quite poorly re-worked from a Hindu god into a praying Buddha. We had lunch in the shade of a huge tree and then visited the Elephant Terrace and the Leper King. The Leper King is so-called because the statue grows moss on it when it gets wet in the rain. The irony is that it is in reality a statue of a Hindu god whose responsibilities include health. The Leper King surmounts and beautiful series of friezes that depict seven levels of hell. By now the Sun was high in the sky and it was blindingly hot. So we got pragmatic ourselves and headed for the pool. 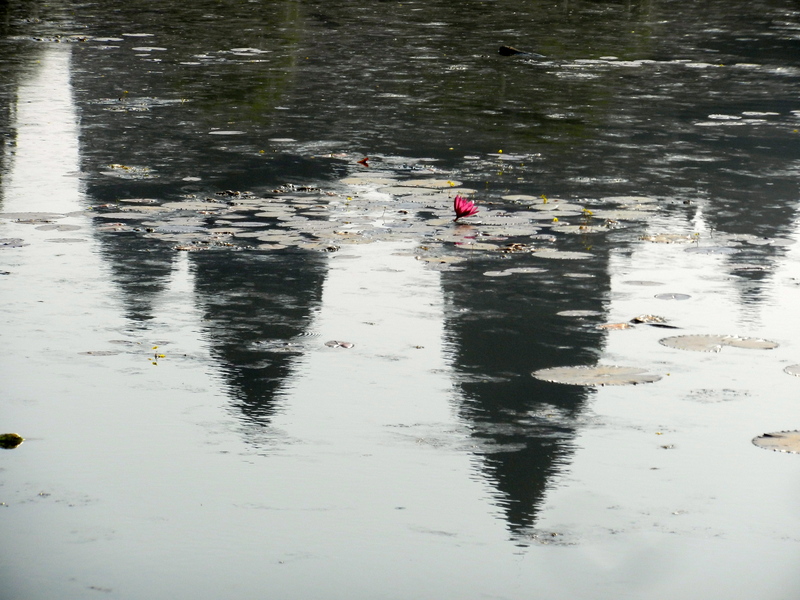 Lilies in front of Angkor Wat. Huge bas-relief in Angkor Wat. From the top of Angkor Wat. Main tower in Angkor Wat. 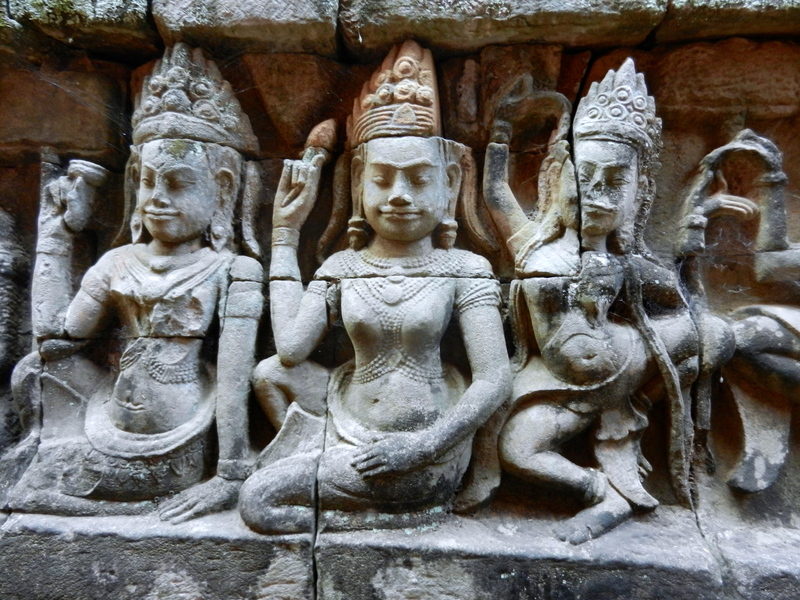 Angkor Thom – eyebrow trim needed. Local children near the temples. 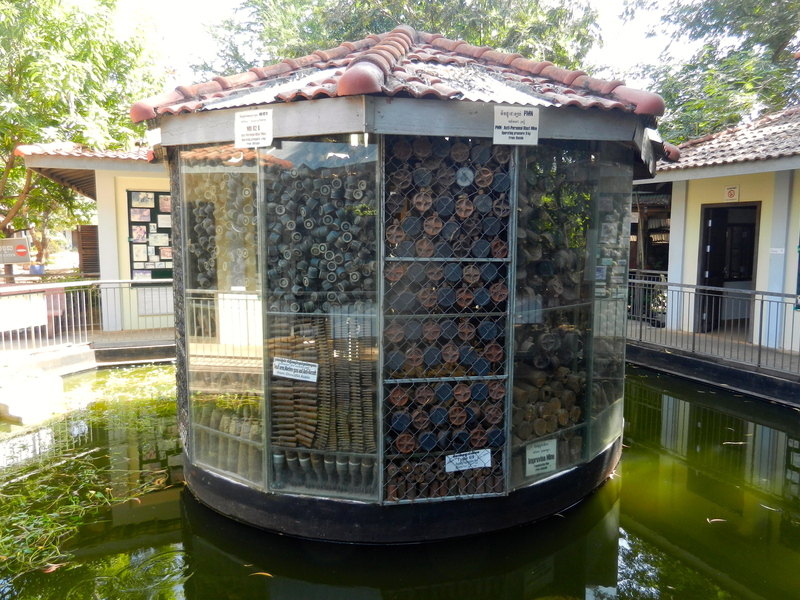 Siem Reap is a classic tourist town, in the centre at least. We took a tuk tuk into town from our hotel, which is out in the countryside, and were immediately assailed by people trying to sell us things. And, really, buying things is about all there is there is to do in the town: The entire economy seems to revolve around persuading tourists to buy stuff. 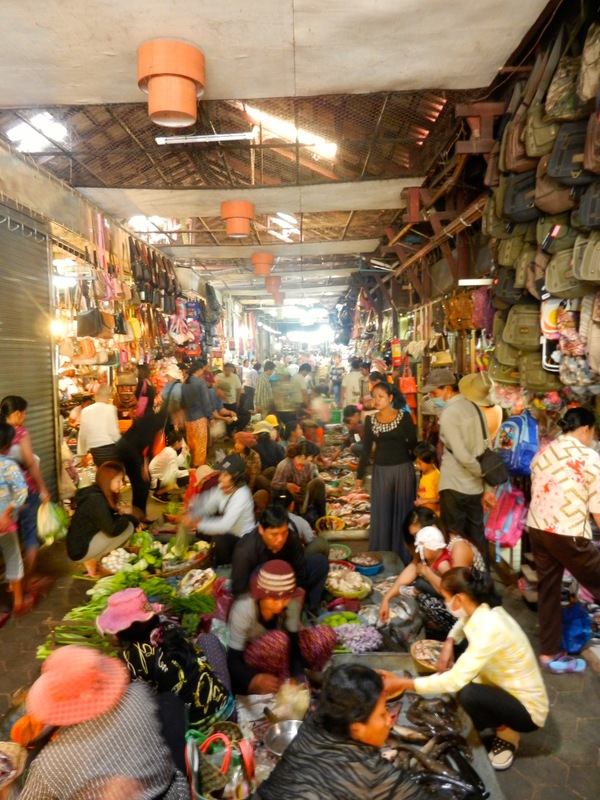 There are markets and tourist shops and tourist shops in markets. It’s hard to understand how there can be the level of demand for wooden elephants and t-shirts that the number of vendors would seem to indicate. Especially since a little research reveals that virtually none of the stuff in the tourist shops is made locally. We didn’t hang about too long; after achieving our main mission which was to get some cash we retreated via the more believable Artisan d’Angkor compound, where you could not only buy wooden elephants but see them being carved, to the hotel pool. 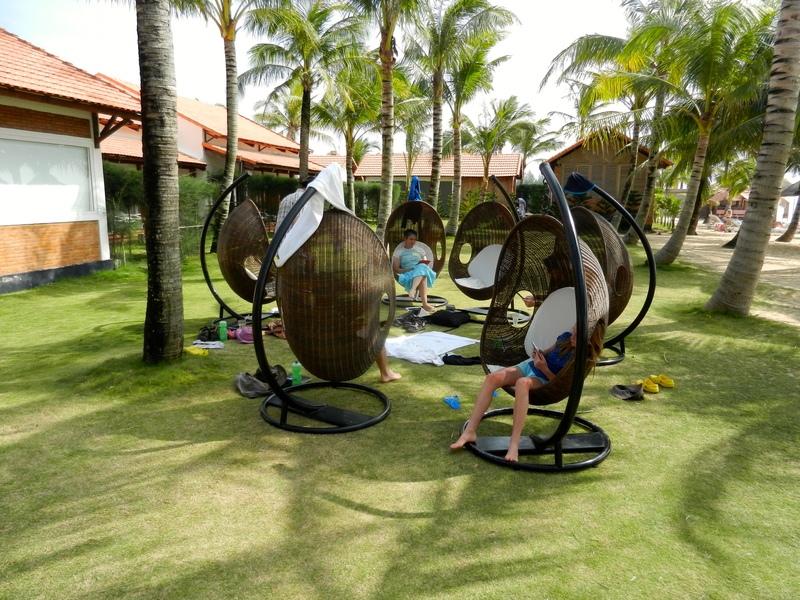 The boys and I had a swim while Jennifer had a massage – and much to the boys’ delight we had milkshakes at the swim-up bar. This evening we saw both more of the same and a different side to the town. We had a picnic on the parapet beside the moat surrounding Angkor Wat. I just want to say that again: We had a picnic on the parapet beside the moat surrounding Angkor Wat. For me, Angkor Wat is right up there with Petra, the Pyramids and Machu Pichu – it’s the stuff of myths and story books and movies. We first had to buy tickets in a process which was a perturbing combination of high-tech and over-staffing. With rather cool-looking three-day ticket in hand, we headed out to the Angkor Wat complex as the Sun began to set. 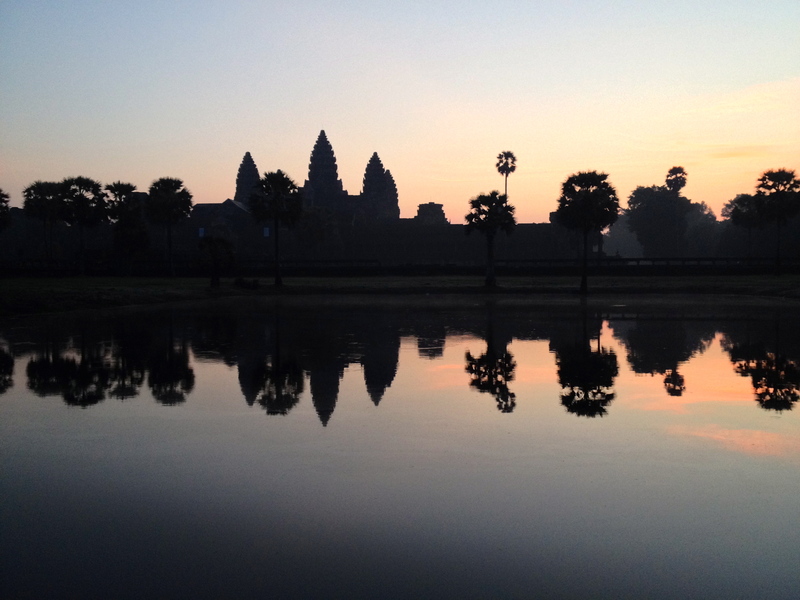 Our first view of Angkor Wat was stunning – the place is immense and, bathed in orange sunset, absolutely glorious. It has to be said, though, that beyond the physical wonder of the place there were disturbing elements. There were people trying to sell tat all over the place. There was the woman begging while holding the terribly deformed child. There was the western man sitting in a chair and having a coke and smiling when he was approached and hugged by two very cute local children. But beyond all that was the beautiful buildings reflected in the calm waters of the moat as the Sun set. The stuff of myths made real. Angkor Wat as the sun sets. Bas relief on Angkor Wat. 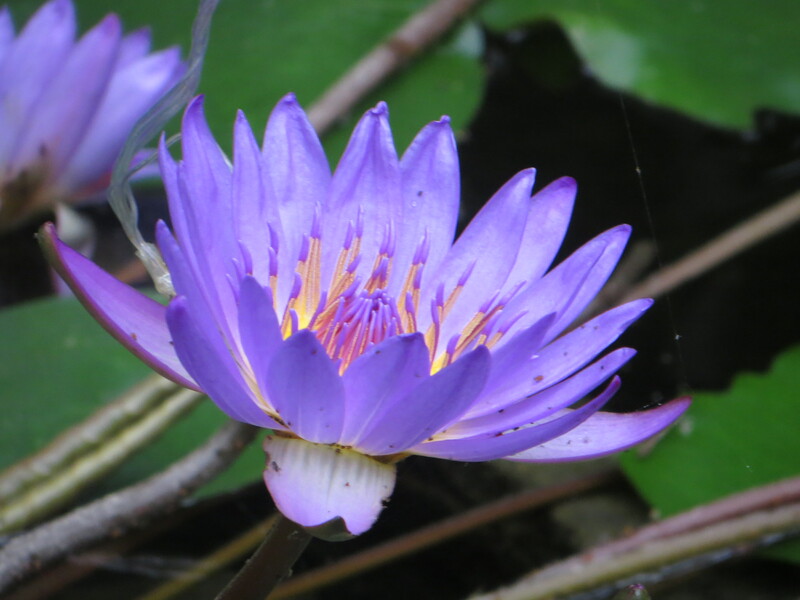 Water lilies in the moat around Angkor Wat. Picnic on the Angkor Wat parapets. On the causeway to Angkor Wat. Tuk tuk to Siem Reap.